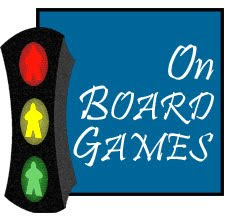 I recently appeared on an episode of On Board Games to discuss playtesting methods. Have a listen, then go read my old playtesting series for more ideas on how to playtest your games. It was very interesting hearing your talk on the podcast. I was glad to hear your insights on playtesting and I kind of wish Don had let you talk more instead of interrupting to put his ideas forward. I'm excited to find your blog, because I'm working on a game design and find your blog very helpful. Thanks for sharing your experiences. Are there other blogs you would recommend that are similar to yours? Though I often disagree with what he writes, I often read Lewis Pulsipher's blog. There's also Bruno Faidutti's. These are both established designers. For something more like mine, you might try Plankton Games Journal. Unfortunately, blogs are less popular with the kids these days. They're turning more towards podcasts. A podcast that I feel is very much like my blog is the "Building the Game" podcast. I like those guys and find their perspective to be closer to where I was when I started this.